In Sports Cards, people make the common assumption that the Market you play in almost completely defines the potential book value of a players' card. Playing in a large market can certainly improve book value, but it has very little to do with the maximum value a card ends at. Contrary to popular belief, the ceiling isn't made out of glass, it's actually made of easy to break through cardboard. It's easy to confuse a player's national marketability with their cardboard stock. On the surface, they appear to be one and the same, in reality, they are two completely different things. A player's national marketability is nothing more than their ability to sell a product. It's based on how effectively they can sell a product to people who may or may not know who they are. They are being paid to put their name behind a product or service in hopes that we will respond by purchasing what they are selling. A players National Marketability essentially boils down to how willing we are to accept their sales call. Sports cards on the otherhand is simple; exposing a collector to a great athlete is preaching to the choir. Card collectors are simply sports fans who relate to the game on a much more intimate level. Cards don't find us, we find them. The more passion there is for a player, the higher their book value is. The greater the player, the greater the value. When a great player plays in a small market, it simply takes their cards a little longer to reach their peak book value, which is a great thing for the collector who is able to spot greatness before others have. Card Collectors respect one thing, that's Greatness. Greatness is reaching the peak of your profession, being one of the greatest to ever play your respective sport, it's doing things we've never seen done, piling up accolades, playing the right way, team loyalty, and winning Championships. None of which have to do with the market you play in. The Yankees are popular with collectors because they have won roughly 1 out of every 4 World Series over the last 100 some odd years! If Market was all that mattered, then the Mets, Nets, Knicks, Cubs, Clippers, Kings, Rangers, and other large market teams would be king makers when it comes to cardboard. If market size mattered, we would just be learning who Brett Favre is. He played the majority of his career in Green Bay, the smallest sports town in the country. 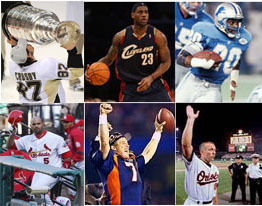 Sports Fans are drawn to the story that greatness writes, it matters not what town the story originates in or ends in, all that matters is whether or not the story is worthy of being retold to future generations. In recent years, the media has tried to make us believe that the size of town determines the greatness of the story, when in reality, nothing is further from the truth. 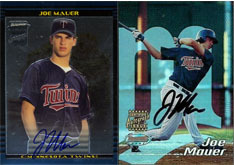 Joe Mauer's signing of an 8 year, 184 Million Dollar contract with the Minnesota Twins should and will boost his card value the old fashioned way, the way that existed before media markets and product spokesman, trough something that transcends a cities population called "team loyalty". 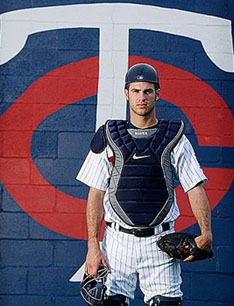 Joe Mauer signed an extension with his hometown team for an amount of money that many would consider to be below market value. Many would see this as a young man selling himself short, a player staying in a pond that he has outgrown, but to Collectors and Sports Fans, it's a sign that Sports can still represent something bigger than Fame and Money. It's a sign of hope to Small Market teams everywhere that the Yankees might not end up getting the face of their franchise after all. Obviously, Mauer would get more endorsements if he played for the Yankees or Red Sox, but to those who Collect Cards, his ability to play the game of baseball is far more important than his ability to sell After-Shave and Under-Armor. 2015 TOPPS CHROME BASEBALL - STARS, ROOKIE RC'S - WHO DO YOU NEED!!! 2013 TOPPS GYPSY QUEEN - STARS, ROOKIE RC'S, HOF - WHO DO YOU NEED!!! 2016 TOPPS CHROME - STARS ROOKIE RC'S - WHO DO YOU NEED!! !